In my last GraphQL post, I talked about the good and bad sides of GraphQL. 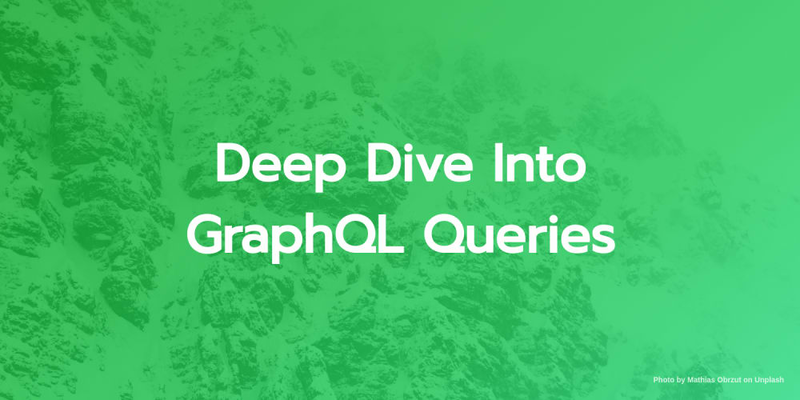 In this post, we&apos;ll take an in-depth look at GraphQL like queries to understand them better and demonstrate how best we can leverage their functionality to build better API&apos;s with GraphQL. Without further ado, let&apos;s get started! At the bare minimum, GraphQL is just about asking for specific fields on objects. Hence, we can&apos;t successfully talk about queries without talking about Fields. Queries are, therefore, the construct used by the client to request specific fields from the server. The payload itself (name) - which is the field(s) requested by the client. The field name returns a String type, in this case, the names of the Manchester United players. However, we are not limited to just Strings, we can have fields of all data types just like the root field players returns an array of items. Feel free to learn more about the GraphQL Type System. In production, we would want to do more than just returning names, the nest could go deeper than that. For instance, in our last query above, we can redefine the query to select an individual player from the list and query for more data on that player. To be able to do such, we&apos;ll need a way to identify that player so we can get his details. In GraphQL, we can achieve this with Arguments. We can&apos;t talk about queries and not mention arguments so we might as well get to it now. Yeah, let&apos;s kill two birds with one stone here. GraphQL queries allow us to pass in arguments into query fields and nested query objects. Moreso, you can pass arguments to every field and every nested object in your query to further deepen your request and make multiple fetches. Arguments serve the same purpose as your traditional query parameters or URL segments in REST. We can simply pass them into our query fields to further specify how the server should respond to our request. One thing we can perceive as a pitfall here is that GraphQL queries look almost the same for both single items and or lists of items. Sometimes it can get a little confusing which one to expect but luckily, we always know what to expect based on what is defined in the schema. One more thing is, GraphQL queries are interactive, you can add more fields to the root field object at will. That way, you, as the client, have the flexibility to avoid round trips and request for as much data as you want in a single request. That alright. Now, what happens if we want to fetch the same fields for two players, not just one? That&apos;s where aliases come in. Now using Aliases, we have successfully queried the same field with different Arguments and gotten the expected response. Until now, we have been using the shorthand operation syntax where we are not explicitly required to define either the operation name or type. In production, the reverse is the case, though not compulsory, it is advised to use operation names and types to help make your codebase less ambiguous. It also helps with debugging your query in the case of an error. The operation type which could be either query, mutation or subscription. It is used to describe the type of operation you intend to carry out. The operation name which could be anything that will help you relate with the operation you&apos;re trying to perform. Where: query is the operation type and PlayerDetails is the operation name. So far, we have been passing all our arguments directly into the query string. In most cases, the arguments we pass are dynamic. Say for instance, the player the client wants his details comes from a text input form or a dropdown menu. That way, the argument we pass into the query string has to be dynamic and to do that, we need to use variables. What are variables you may ask? variables are basically used to factor out dynamic values from queries and pass them as a separate dictionary. Here, $title: String is the variable definition and title is the variable name. It is prefixed by $ followed by the type, which in this case is String. This means that we can avoid manually interpolating strings to construct dynamic queries and that is awesome. The ability to extract a piece of shared code and reuse across multiple fields is a very crucial concept that helps developers not go DRY - (Don&apos;t Repeat Yourself) in development and even in production. If you&apos;re working on a deep layered codebase, you&apos;ll find it rather useful and timely to reuse code rather than repeat your self across multiply components. We can reverse this situation using the *@include directive. *It works as the opposite of the @skip directive. Needless to show, you can use it to reverse this skip action on the server simply by replacing @skip directive with @include in the query. In this article, we have gone over the not so popular bits of GraphQL Queries in the simplest way possible. This is in response to the many requests i got to cover Queries after my last GraphQL post. Subsequently, we&apos;ll take an in-depth look at other GraphQL features like Mutations and Subscriptions to uncover their unpopular but useful concepts. Until then, Happy New Year. Modern Mobile/Web Software Developer and Advocate. Program Manager at Sealuse.